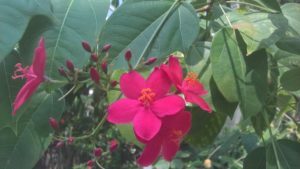 Jatropha integerrima is an evergreen shrub that grows to 4.5m tall. It has glossy leaves that are variable in shape, with bright rose-red flowers that resemble clusters of stars. Peregrina is not at all hardy and must have a minimum temperature of 10 degrees in winter, as well as plenty of sun and well-drained soil. It is therefore only suitable for a warm conservatory or warm outdoor climate. Peregrine responds well to pruning in late winter, before the flowering season begins. To propagate the seeds, you need to sow them during the spring or summer, in a heated propagator at a minimum of 24 degrees. Cuttings can also be taken in spring, but must be left in a shady place for a few days to allow the cut to callous over. Once this has been done, insert them into sandy compost, before propagating them with bottom heat to encourage root formation. Jatropha is a member of the Euphorbia or spurge family (Euphorbiaceae) and contains a milky sap that can irritate sensitive skin. All parts of the plant are reported to be poisonous if ingested.